Colleen's Window on Italy: The Love of Gardens! I have always taken great pleaseure in gardening having inherited my mother and grandmother's green thumbs. At our home in Seattle I had years of joy creating a palette of pinks, lavendar, purple, blues and white perennials and roses and draping climatis that clung to every tree and fence. It was a fragrant and visual paradise that soothed my soul. It was the place where fairies hung out and where my daughter, Laara, spent many hours during her formative years. This June, Laara asked me to help her re-create that paradise in her garden in Nesoddtangen, on an island just outside Oslo. Her garden already had "good bones" with an abundance of apple and plum trees, grape and climatis vines and interesting levels, nooks with both shade and sun. Mature bamboo, hydrangea and ferns created a natural border between deck and yard. Five apple trees were espaliered all along three fences surrounding the back yard which gave much visual privacy and of course, abundant apples in the late summer and early autumn. Climbing vines and climatis had already been trained up and over several trellis to create little gateways to transition between level of the deck to yard and out the gate to alleyway. Even the outdoors comes inside her beautiful house with its skylights and bank of windows. What did this garden need to remind Laara of her childhood paradise? A few perennials and roses tucked here and there and some extra color, we decided. Part of the joy of gardening is in the planning and the other part is searching out the plants! So after many exquisite trips to local nurseries, we got down to the actual planting. Exquisite? Well, let me put it this way: I was famous for making repeated trips to nurseries and one year my dear Mother threatened to post a sign "Do Not Sell Anymore Perenniels to This Woman!" Like mother like daughter, for Laara was as enthusiatic as I to make these trips together. Since Norway is much like Seattle, we decided on David Austin heirloom roses noted for their abundant fragrance, astilbe and delphiniums for structure and the color palette of rose, pink and purple with some yellow and orange thrown in for fun. The fully cupped roses add fragrance and beauty to the table. We added a pale yellow rose to the back deck and planted containers of perky yellow and orange nesturtiums, blue lobelia and orange begonias for a riot of color to spill onto the deck beside the outdoor table. And that is just the half of it! Laara's front yard presented many opportunities for creativity for sun and shade plants. There was already a willow tree draped across the cobble walkway lined with perenniels and a bower of climatis vines at the front gate. We chose pink and purple astilbe, bleeding hearts with dainty pink and white flowers and a deep purple lace fern for the corner shade garden. More fragrance and color went into the sun filled front seating area with red climbing roses, yellow honeysuckle vine, and containers of lobelia, lavender, begonia and tall pink cosmos that always remind me of my mother's self-sowing annual gardens. Mature grape vines climb over fences and reach to the top of an evergreen tree, and the huge climatis with tiny white flowers wants to take over the front window but has to be tamed each year. Current berries appear by the middle of August along with the plums and apples. My heart leaps with joy and is filled with the creativity of gardening with my beloved daughter, Laara. I certainly am a lucky lady to live between two worlds: Piegaro, Italy and Oslo, Norway. 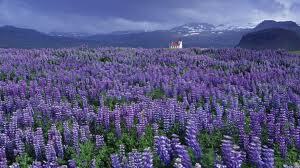 Next year we will transplant some wild lupine that fill every meadow in Norway.